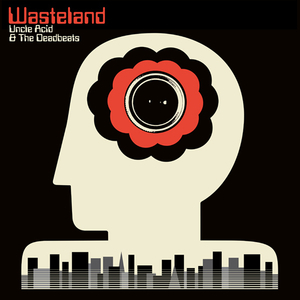 Uncle Acid & The Deadbeats - Wasteland, 17,03 fr. Neues Album! Auf das 5. Album der Stoner-Doom-Retrorock-Institution wartet man nun schon seit 3 Jahren! Es wird 3 verschiedene Farben in je 2.000er Auflage geben: schwarz, vanilla und fluorescent orange! You can probably feel it already. Amid the shimmering haze of dusk. In the marrow of your bones. The darkness is getting darker. Malevolent forces are on the prowl. The wasteland is beckoning. Uncle Acid is on his way home. A disorientating journey through Kevin Starrs (AKA Uncle Acid)´ wonkiest dreams, Wasteland glides majestically from punchy and direct psych-rock anthems like "I See Through You" and "Shockwave City" to the viscous, somnambulant ooze of the eight-minute "No Return" and the twinkly-eyed bad trip of the album´s mesmerising title track. Recorded at the legendary Sunset Sound studio in Los Angeles, Wasteland boasts the kind on irresistibly raw and exuberant sound that only the greatest bands can generate. Yet more confirmation that Uncle Acid exist in their own musical universe, Wasteland is also a powerful cautionary tale: one rooted in the alien landscapes of Starrs' imagination, but with a very clear connection to the deranged chaos of today's political world. As humanity cheerfully circles the plughole, Dystopian visions and present-day horrors have become more-or-less interchangeable, making Wasteland´s ghoulish surrealism a lot more pertinent and disturbing in the process. While most musicians seem content to chase their own (or other people's tails), Uncle Acid & The Deadbeats remain proud and resolute individualists and Wasteland is simply their most powerful and memorable spurge of creativity to date. Masterfully echoing the magical atmospheres of heavy music's turbulent past while sounding entirely unlike anything else available to human ears, this is what happens when the shadows come to life and suffocating darkness, Uncle Acid & The Deadbeats style, is the only show in town. Admiral Sir Cloudesley Shovell - Keep it greasy! Clutch - In Walks Barbarella/Bottom Feeder - pic 7"